By now, you’ve looked with me at anger from several perspectives-what anger is and where it comes from and what happens when we internalize or vent our anger. Today, we will begin to probe together what is within the structure of PROPERLY MANAGED ANGER. That structure is made up of the following components: 1) It has a purpose; 2) It corrects destructive behavior; 3) It is without hatred; 4) It expresses care; 5) It is not selfish; 6) It keeps the relationship; 7) It expresses concern; and 8) It focuses on injustice toward God. Today, let’s discuss the fact that properly managed anger HAS A PURPOSE. Healthy anger can be used to bring positive results in our lives. Perhaps it’s time for a change in your job. Maybe it’s time for a change in your attitude. 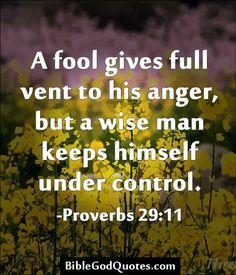 Healthy anger organizes life around the Father instead of around the pain and hurt you may have experienced. In order to bring about healthy change, it is important to process anger rationally. No matter what the cause, we need to accept our personal responsibility for our own anger. Here it is important to be open to the help of the Holy Spirit in managing our anger and to bring about HEALTHY CHANGE THAT’S TRULY FOR A PURPOSE. Our part is to cooperate with the Holy Spirit as He guides and enables our lives. Paul writes, . . .present your bodies . . .to God . . .Do not be conformed to this world, but be transformed by the renewal of your mind . . . What a great encouragement for us to allow this transformation process to happen within us. It takes a decision on our part to become available to the Holy Spirit to make us a process of progress. With the Holy Spirit along side us, we can restrain our anger allowing Him to make available to us His resources for our success. Make a decision this very day, that in whatever circumstance you find yourself-if you find your anger beginning to rise-acknowledge it and bring it directly to the Lord asking for His guidance and His solution. Ask Him what progress He is trying to accomplish in your life or your situation. You Will Receive A Correction!